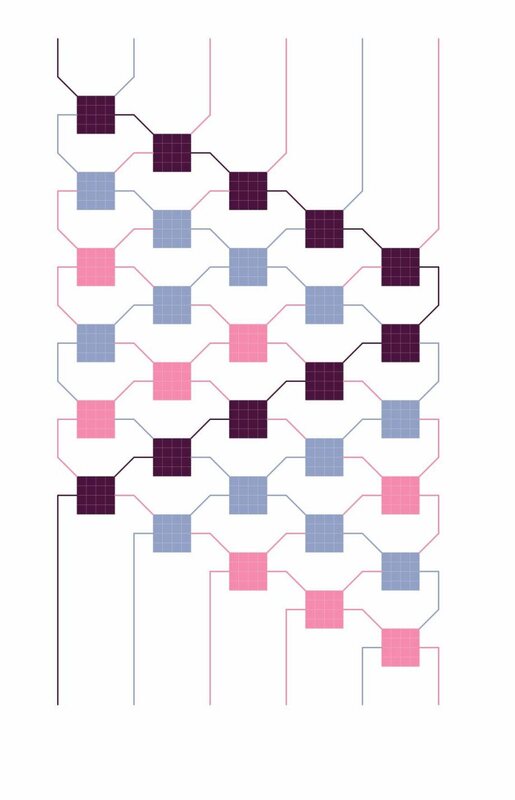 In this pattern the zigzagging purple thread stands out.The first two rows are different from the repeating pattern between the dotted lines. 4 Repeats of the pattern is about 8 cm (3 inch) lang. For 4 repeats you need about 66 cm (26 inch) of purple thread (thread 3), about 54 cm (21.5 inch) of the blue thread that makes the most knots (thread 4), for the other blue thread (thread 1) about 27 cm (10.5 inch), for pink (thread 5) about 48 cm (20 inch), pink (thread 6) about 39 cm (15.5 inch) en pink (thread 2) about 34 cm (13.5 inch). 1. Start with placing the threads in the order as shown in the upper part of the picture. So, from left to right blue, pink, purple, blue, pink, pink. 2. 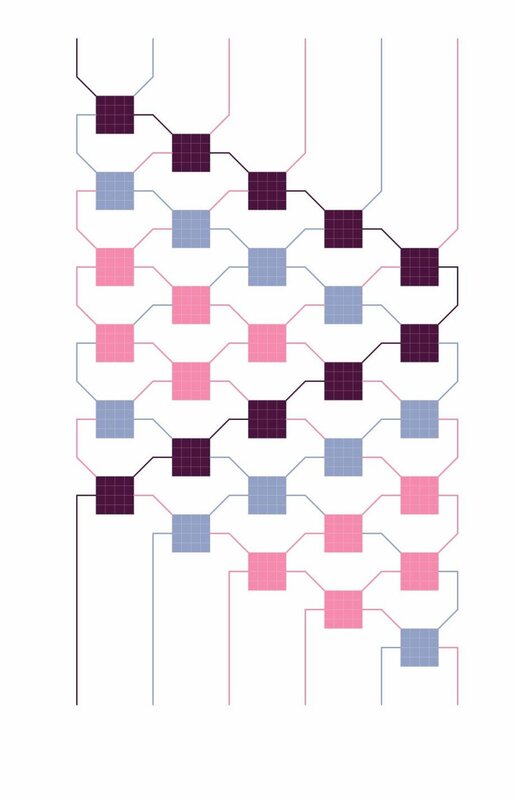 Start by making two rows of 5 double right knots with blue and subsequently pink. 3. The repeat of the pattern starts here. Make 5 double right knots with purple. 4. Make 4 double right knots with the utmost left blue thread. 5. Make 3 double right knots with the utmost left pink thread. 6. Make 2 double right knots with the utmost left pink thread. 7. Make 1 double left(!) knot with the utmost left pink thread. The upper part of the zigzag-motif is now finished. 8. Make 5 double left knots with the utmost right purple thread. 9. Make 4 double left knots with the utmost right blue thread. 10. Make 3 double left knots with the utmost right pink thread. 11. Make 2 double left knots with the utmost right pink thread. 12. Make 1 double right(!) knot with the utmost right pink thread. The lower part of the zigzag-motif is now finished too. 13. Repeat the steps from 3 to 12. In the following examples variations are made with the motifs between de purple lines.